Can you confirm these amateur observations of Hydrophis mamillaris? Type locality: "Vizagapatam." [=Vishakhapatnam, extreme northeastern Andhra Pradesh, India]. Types Holotype: BMNH 1861.12.30.38, a 650-660 mm male (R.H. Beddome), lost. Distribution: not known from Thailand fide Merel J. Cox (pers. comm., 27 Oct 2018). Daudin 1802. Histoire Naturelle, Générale et Particulière des Reptiles. vol. 7. Paris: Dufart , 436 pp. Kharin, V.E. 2005. On new findings of a rare sea snake Leioselasma czeblukovi Kharin, 1984, with remarks on species composition and taxonomical position of the genus Leioselasma Lacepede, 1804, (Serpentes: Hydrophiidae). Russian Journal of Marine Biology 31 (5): 269-272. Kharin, Vladimir E. and Vladimir P. Czeblukov 2007. 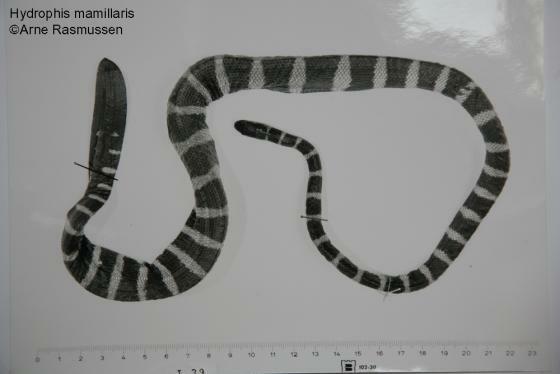 On First Reliable Record of the Sea Snake Chitulia belcheri (Gray, 1849) from Australian Waters, with Notes on Species Composition and Taxonomic Status of the Genus Chitulia (Serpentes, Hydrophiidae). Russian Journal of Marine Biology, 33 (3): 161–165. Sharma, R. C. 2004. Handbook Indian Snakes. AKHIL BOOKS, New Delhi, 292 pp. Smith, M.A. 1943. The Fauna of British India, Ceylon and Burma, Including the Whole of the Indo-Chinese Sub-Region. Reptilia and Amphibia. 3 (Serpentes). Taylor and Francis, London. 583 pp.